Take a walk along any shore line – the odds are you’ll see at least a few rocks with a wrinkled pattern like the one below; what are these wrinkles? The answer is surprisingly complex, and has had geologists scratching their heads for decades, but now, that riddle may have finally been answered. The problem with these patterns is that they don’t appear in modern environments – so whatever was causing them (or at least some important factor) was lost along the way. To make things even more interesting, these patterns seem to be much more abundant in periods following mass extinctions. Now, MIT researchers believe they have discovered an underlying mechanism which may explain the formation of these wrinkles. Based on this mechanism, they believe that the wrinkles are in fact signs of ancient life – wherever they were found, microbial life abounded. 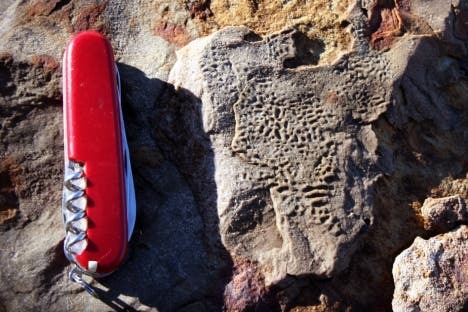 The oldest such patterns were dated to rocks up to 575 million years old — from a time when the earliest animals may have arisen. Some paleontologists seemed to believe that they were the result of ancient sea foam, while others put the money on the ocean waves. But the majority seems to be on microbial activity – and this study seems to confirm that. Following an extinction period, microbes take over the seafloor in wide, leathery patches that were tough enough to withstand the overlying flow. In order to test this theory, the researchers went into the lab by growing microbial mats in custom-built wave tanks, partially filled with sand, setting up time-lapse video to track the evolution of the sea floor model. The results were quite significant. After a few days, he spotted tiny, millimeter-wide ripples in the sand. Looking back at the time-lapse images, he discovered the mechanism – fragments of the microbes were rolling on the sand and rearranged the sediments to create wave like patterns. More controlled experiments with more and more controlled environments confirmed that it is indeed, microbes that create the patterns – not whole microbes, but microbial fragments, rolling around in the sand, creating the wrinkled patterns we see today when the sediment solidifies. Understanding this process could be very important for understanding life not only on Earth, but on other planets as well, as David Bottjer, a professor of earth sciences at the University of Southern California explains; if we find such wrinkles on another planet (say, Mars), we can say, with satisfying certainty, that there was, at one point, microbial life on Mars.